CROSSVILLE, Tenn. – A flock of buzzards erupted out of the corn field, massive wings carrying them reluctantly away from their bounty. “That must be the spot,” said one youngster trudging into the corn. Quickly a foul odor confirmed the suspicion. “Hey guys. It’s over here,” exclaimed Leroy Gonzales, a senior from New Mexico Highlands University. 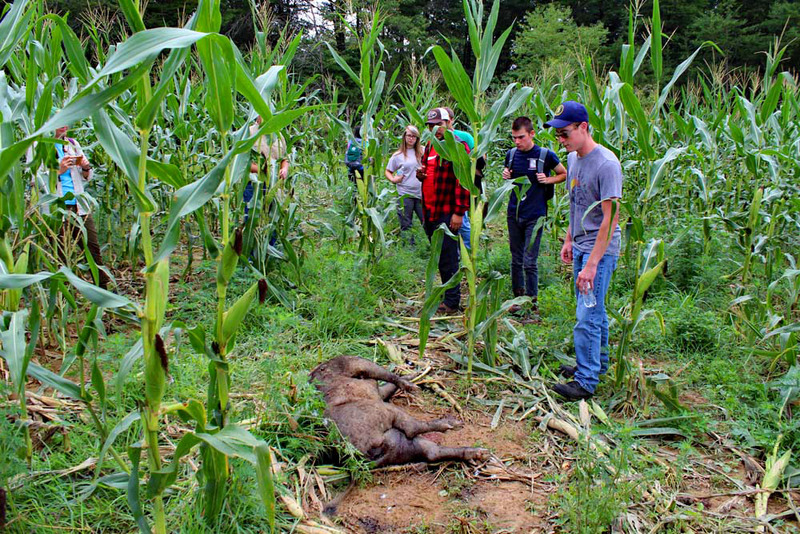 These college students were on a field trip to the Catoosa Wildlife Management Area, Ground Zero of the hog wars. TWRA Wildlife Manager Casey Mullen shot and killed the wild boar two days before as it was in the process of rooting up and decimating the Catoosa WMA cornfield. 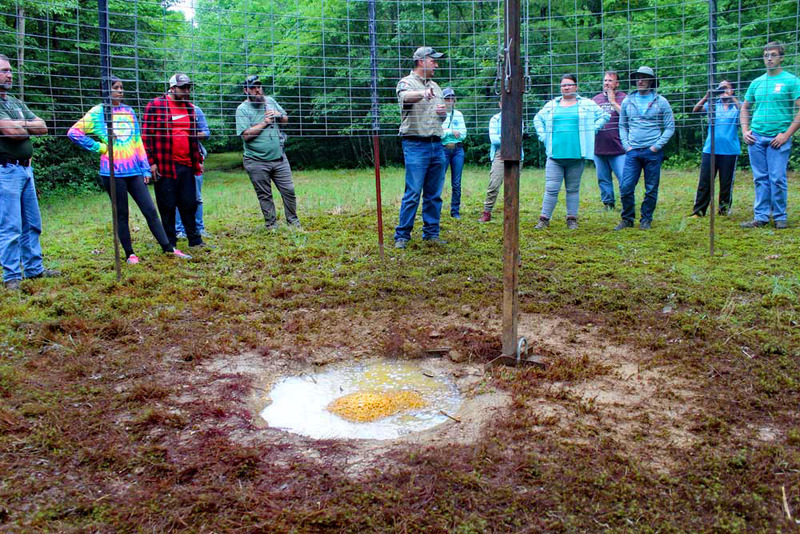 The lesson for the day was to teach these future wildlife and natural resource professionals about TWRA’s efforts to control a growing population of destructive wild hogs across the state. This story is really about the Student Wildlands Adventure Program, SWAP for short. SWAP is the brainchild of Cleveland State University wildlife professor Robert Brewer and Daryl Ratajczak, the former TWRA Chief of Wildlife, now working for the U.S. Forest Service in New Mexico. Brewer and Ratajczak basically created an exchange program, now in its second year. Last year Brewer’s Wildlife Society students from Cleveland State visited New Mexico. This year they reversed the process, bringing eighteen natural resource college students from New Mexico to visit Tennessee for a week. It is a horizon-broadening exercise and a sharing of cultures, all with wildlife and conservation as the primary focus. The road trip to Catoosa WMA was just one of a weeklong whirlwind of outdoor activities the young men and women from New Mexico experienced. But what they all seemed to be most impressed by was Tennessee’s trees and water. “Lots of green – green, green, green everywhere,” exclaimed Charlene Juanico who grew up in a New Mexico desert. 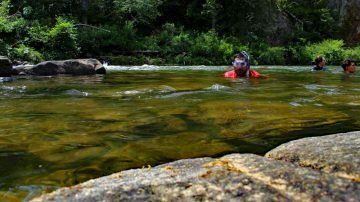 I interviewed Charlene standing alongside Daddy’s Creek, a pristine stream that slices through the lush Catoosa WMA ridges on the Cumberland Plateau. 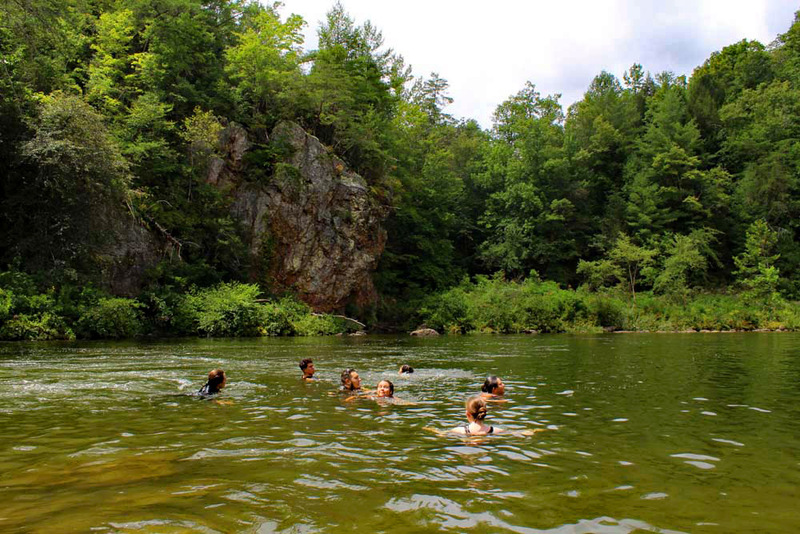 Guided by Fisheries Biologist Mark Thurman and other TWRA folks, the youngsters swam and snorkeled in the cool water – a luxury rarely afforded in their home state. Gonzales clearly enjoyed his tour of Catoosa learning about TWRA’s efforts to control wild hogs. But the details of each day’s wildlife education paled in comparison to the overall experience, at least for Charlene, a junior wildlife conservation major at New Mexico State University. Sometimes the education comes in unexpected places and unexpected ways. Of course the program doesn’t come cheap. But he and Brewer have beaten the bushes so that the youngsters chosen to participate haven’t had to pay a dime. Last year Brewer received a grant from Cleveland State. This year Ratajczak’s employer, the U.S. Forest Service provided a grant for the New Mexico youngsters. The future of SWAP is up in the air. Ratajczak and Brewer say it is always dependent upon finding one major benefactor. They don’t want the youngsters to have to pay for the cross-country program. You can rest assured, however, the two wildlifers will be out beating the bushes once again so they can continue to SWAP in the future.